All of the Jillily Studio applique tools are included in one set. These tools are just what the quilter needs to achieve easy and beautiful applique results. They come all packaged in a cute red tin with Jill’s instructions for Applique the Jillily Way. 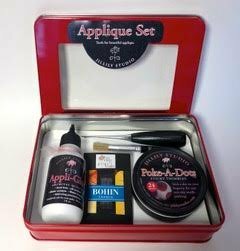 Set includes Appli-Glue, Quiltler’s Digit, Starch Brush, Poke-A-Dots and Bohin Applique needles.